We’ve given away our first quilt as we have saved them for special needs/families. They were so happy to receive it. Thank you Trinity Evangelical Lutheran Church for giving me such a wonderful, beautiful and much needed gift. This gift was was presented to an individual through DCOM – Mobile Pantry. 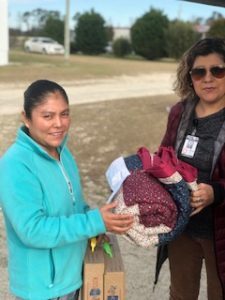 This pantry work with the Migrant population located in Duplin County. Duplin Christian Outreach Ministry is so very proud to be able to serve all of Duplin County citizens because of the wonderful volunteers that are willing to give so much of their time. 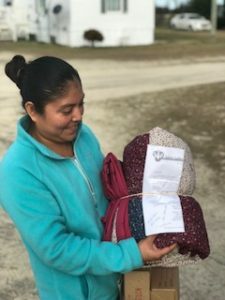 The quilt was made by the “Naughty Knotters”, a group from the local community in East Berlin, PA and trusted DCOM to get these gifts to individuals who are in need. This is truly a reflection of the love Jesus Christ. In a crisis in you are not alone. We are here to help in your time of need. A phone call will go a long way with us. You will need a referral from DCOM. 9:00 am to 11:30 pm.